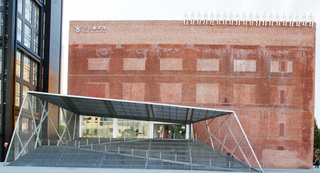 Beijing Today Art Museum was founded by Mr.Zhang Baoquan in 2002. It has been managed by the current director, Mr. Zhang Zikang since 2004. The museum aims to promote Chinese contemporary art based on an internationalized vision and a contemporary ideology. As the first non-for-profit, non-governmental run art museum in China, it dedicates to explore an appropriate development strategy for museums of its kind within a Chinese context. "Basing upon now and prospecting the future" is the idea of Today Art Museum. Constructing the best contemporary art museum of the world is our goal. We pay attention to Chinese contemporary art, art genre and key man. At the same time, we pay attention to the finding and supporting of the young artists. We engage in the constructing of the museum framework and the technical practice. And our aim is paying attention to the whole development of Chinese contemporary art. At the same time, Today Art Museum develops all kinds of communications with international cultural and art institutions with exhibits and learning communications. Today Art Museum quests for the developing mode for non- public operating museum actively. We try to set up reasonable financing machinery and a self-contained working system. Our working attitude is relating to reality concretely, and a countenancing financing mechanism and a standing learning system is shaping step by step. Today Art Museum persists in high standard learning character and morals. Building high level international learning rank and topping researching team is the base of all the other works. Today Art Museum thinks much of the exhibit plans, and insists the classical essentiality, technicality and the contemporary meaning of all our exhibits. In our exhibits, we give attention to two things: artistic characters and social functions. We emphasize the intervention and promotion to contemporary art, and our ambition is constructing the highest platform of contemporary art. Today Art Museum pays attention to the collection and research of the museum collection. Contempor ary painting is our main collection. And all kinds of contemporary art works with different media are in our collection too. The collection of Today Art Museum has three sects: non-profitable collection of Today Art Museum, contemporary art works collected by Today International Culture and Art Ltd., and the trusteeship collection of other collectors. Today Art Museum regards the building of the propagandizing platform. We publish several art magazines in kinds of learning dominions. At the same time, we compile and publish nearly 300 pieces of art books and theoretic works, which can provide important reference and investigating modes for the promoting, populating and deep researching of Chinese contemporary art. Today Art Museum thinks much of the repertory of art information. Picture Information Center and www.artnow.com.cn can perfectly present the actuality of Chinese contemporary art. They create the panorama record of contemporary art, and record it with high level digital technology. They will fill up the blank of the historical materials. Today Art Museum regards art enjoyment and education, and wants to associate them to create more chances for more people. We believe that it can help and drive people to upgrade their artistic taste. Besides exhibiting large paintings, the museum also adapt to exhibit great installations and sculptures. Video, new music and other art integrative forms would show us their attractive art effects too. As the first non-profitable museum, all of its exploration would have important and special meanings. We participate, discover and create. All we do will offer a new active space to Chinese contemporary art. A special cultural platform with modern humanity consciousness will appear. Duty To impulse Chinese contemporary art. Today not only is now, but also is past and future. We take on the art of today, and we share in the art of today too. Achievement Today Art Museum pays attention to Chinese contemporary art, art genre and key man. At the same time, we pay attention to the finding and planting of the young artists. We want to promote the artists, art institutions and art movements inside and out side contacting continually. Eliminating the gap between the masses/the museum, art practice/exhibiting space, exhibiting space/audience, and audience/artists. To make "art of today" being felt, known and accepted "now" is our aim. System To form and develop a suit of steady learning system, framework, managing flow and financing mechanism, we engage in exhibitions, learning research, art education, museum collection, contemporary art works authenticating, art salon and art bookstore. Our operating systems are more rational and self-contained.